alaTest has collected and analyzed 14 reviews of Storage Options Scroll Extreme 2. The average rating for this product is 3.7/5, compared to an average rating of 4.5/5 for other products in the same category for all reviews. Reviews about the touch screen and usability are generally positive. The size and price also get good feedback. Opinions about the screen and performance are mixed. We analyzed user and expert ratings, product age and more factors. 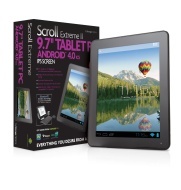 Compared to other products in the same category the Storage Options Scroll Extreme 2 is awarded an overall alaScore™ of 80/100 = Very good quality. Looks good, same size as IPAD 1 so plenty of choice for cases etc. Looks like a much more expensive model and works well, bought a replacement for my son, as the imported Zenithink ZT-280 C91 bought from Ebellking.com as a birthday present lasted lasted only 4 months. Only the fact that ITV player doesn't work with the tablet at present. Very capable tablet for the price, screen is nice and clear, touch screen is responsive, google play store included. Processing is a bit slow but for the price I think it's good.